Last night I had to attend a moot court alumni reception in downtown Miami at a large law firm. There were hors d'oeuvres and plenty of wine, beer and soda to go around. Although mingling with alumni was slightly nerve wracking and awkward, I had fun and enjoyed talking to some of my friends. My favorite Theory suit is in need of a dry cleaning so I decided to wear some of my newly purchased items that go great for fall. Although I really liked this outfit, I probably should have donned the usual black or grey to blend in better with everyone else. I was definitely the only person in a rust jacket! It's fine though because I lost the jacket within 5 minutes of walking in (it was super hot in the room anyway), and plenty of women were just wearing blouses so it was No Big Deal. I actually forgot to accessorize because I was running late, but found this necklace inside my wristlet. 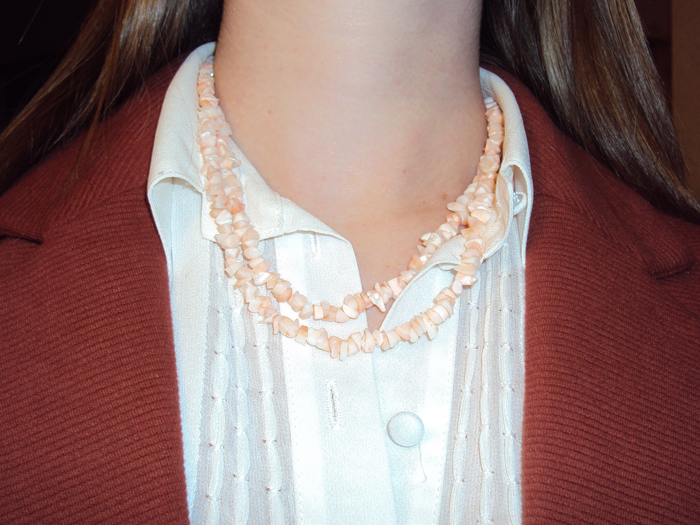 I think the light pink/coral goes pretty well with my neutral ensemble. I also remembered to make sure I captured the "texture" of this Textured Knit Blazer this time! 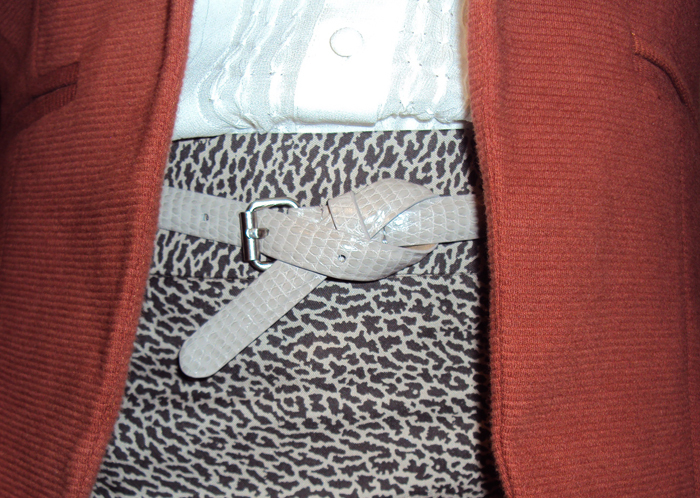 I love this close-up picture to show the texture on the blazer, the snake skin embossed belt, and the subtle animal print skirt. Although what kind of animal print is that? I certainly have no idea! This is serving as my FIRST bloggers do it better challenge post! Head over to Kristina's blog, Pretty Shiny Sparkly to see all the other entries and see how everyone wore their animal prints! love the outfit. you look so smart! This is a perfect example of how print can look SO classic & chic. Great job!! You look beautiful. Such a lovely outfit. 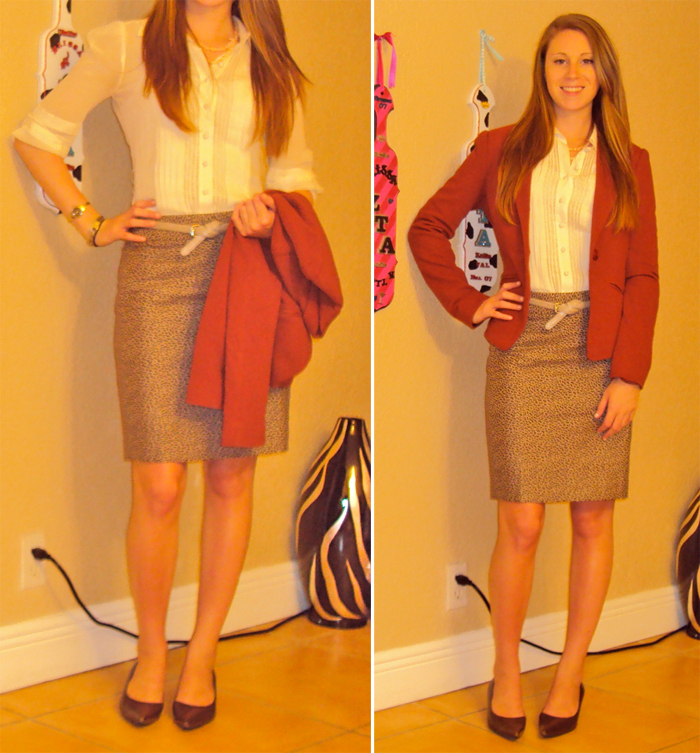 I loveee that blazer! I love your skirt! I really need to get back to Ann Taylor apparently. And that blouse is so cute! Love your style....So darling!!! I would love for us to follow each other.